"2 bedrooms, views of the mountains, skiing from away home - without a car"
The cozy and comfortable 2-room apartment is on the first Floor of the beautifully situated and well-kept apartment house "Anderl". The house is located at about 1000m above sea level right next to the ski slope to the ski center Hintermoos. 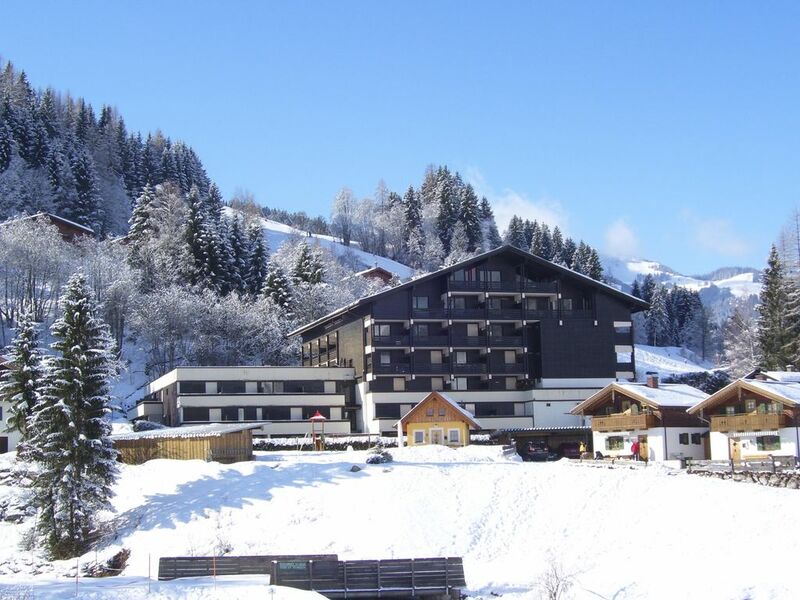 A paradise for skiers and snowboarders - from the locker of "Anderl" `s directly into the magnificent Hochkönig Ski Amade with over 30 modern ski lifts, snow-covered slopes of all levels and the most rustic huts in Austria - and all without a car. A practice slope with a children's ski school is also within walking distance at 200m. Of course, the region provides everything you could want for relaxing, yet active stay. Besides lighted toboggan runs and night skiing pistes, perfectly groomed cross-country skiing, romantic sleigh rides through the snowy woods of the unique nature resort, the evening ski show of the ski instructors teams from Maria Alm is an absolute highlight in Glühpunsch and Jagatee. But even in the snow-free seasons, the region offers everything your heart desires. Whether small or large hikes, with or without a chairlift support - the mountain huts look forward to seeing you there. Mountain biking, archery, golf, climbing ropes courses, summer toboggan run, mini golf, and not least the Erlebnisfreibad in the beautiful mountains of Maria Alm delight young and old. The icing forms of weekly Almer Dorfabend - weather outdoors - with show and musical entertainment of the local costume and music club. Become one with local tradition and loving hosts. Not to mention the bewitching Bauernhebst with its culinary specialties-weeks and his coronation at the legendary cattle drive. In the pre-Christmas time Maria Alm inspires its visitors with a unique Christmas market. The lovingly decorated small huts of local clubs looking with their delicious tastings of their peers. "MARIA ALM AND HIS MASSIF the STEINERNE SEA" - here the world is still OK! As the area also offers the apartment house "Anderl" everything your heart desires. Free parking with in and Ausladezonen directly at the front door, ski or Bicycle storage, leisure rooms with table football, table tennis and bowling alley - the latter for an additional fee. Free Wi-Fi and an additional Internet room with a library. Laundry room with washing machine and Münztrockner-. An elevator brings you and your luggage through all floors. The wellness area with panoramic windows and views in the beautiful mountains of the High Kingdom gives you rest and relax in the spacious indoor swimming pool and sauna area with relaxation room and outdoor outer zone. The attentive and helpful caretaker couple makes besides cleanliness and order for the morning fresh bread and pastries on preorder. From their 2-bedroom apartment "Dari" with large balcony terrace looks directly into the delightfully peaceful meadows and mountains of the "Steinerenen Meers". The covered outdoor area has enough space for a sunny outdoor breakfast, a hearty meal in the afternoon or a pleasant sun with coffee and cake. Tables, chairs, couches, cushions and umbrella are available. Renovated in 2016 and newly furnished apartment gives you to just 60m² can accommodate up to four adults and two children. The Non smoking property (please note) is divided into a separate bedroom in a double bed (2x 90x200cm fitted sheet) and children's bunk bed (2x 90x200cm fitted sheet) and a further living and sleeping areas. The residential couch with ottoman is quick evening and fold easily into a sleeping area (fitted sheet 160x200) with a gel mattress. For their little ones can be found on the cupboard in the bedroom a cot. Note: Linen can be hired when needed about our caretaker. The lovingly decorated in country style to the last detail unit further includes a flat-screen TV with cable, stereo with cable radio, USB port, CD and cassette operation. In addition to music cassettes and CDs enough books for bookworms and games about design cozy evenings are available. The luxuriously furnished and equipped kitchen has a 4-plate electric stove with oven, because tastes in Austria fast times a homemade pizza. Extractor hood, fridge freezer, water and egg cooker, toaster and a filterless coffee round out the ambience. The cozy, rustic seating area with space for all completed the Alpine overall picture. The bathroom toilet with bath and hand shower gets through its 2-flügliges window as much daylight as the living rooms and bedrooms through their generous sash windows. Additional shower facilities can be found naturally in the spa. More spacious shower facilities are located in the spa pool and sauna. Fijne appartement met goede bedden, ook de bedbank was goed en praktisch. Het was er schoon en alles was aanwezig. Fijne eethoek, fijne keuken, fijne bank. Het balkon was niet in de zon dat was jammer. Verder genoten van de ligging van het appartement omdat het zo dicht bij piste was en bij een restaurantje aan de piste. Er was genoeg parkeergelegenheid. We hoefden niet te wachten bij aankomst en de sauna en het zwembad waren heerlijk. Ook hebben we erg veel plezier gehad tijdens het tafeltennissen. Det var perfekt for os fire, lejligheden havde alt vi behøvede og fællesfaciliteterne var pæne og indbydende. This flat is perfect for a small family. Single bedroom with one double bed and two single (bunk-style) beds. Separate roomy living room with nice corner eating area. Small but well appointed kitchen, and a bathroom with bath/shower. The furniture is tasteful, comfortable, and well-suited to the mountain holiday atmosphere. There's a lovely big balcony off one whole side of the flat with views of the mountains. Black out shutters can be pulled shut for those who like to sleep in late. You can ski almost all the way back to the flat from the slopes (note: only if everyone in the group is intermediate/red-level skiier, there are no blues that get you there). Only 150 meters or so to walk to/from the nearest ski slopes. In the basement there's a great family relaxation area for shared use w/the other apartments in the building. We met fun people there and enjoyed the table tennis/bowling/pool/sauna. Convenient basement racks for storing and drying out ski equipment, sleds, etc. Important to note that flat is self-catering and the one nearby restaurant stops serving food very early (7/8pm). Nearest grocery store is 5km away in Maria Alm village, so definitely stock up on supplies before arrival. Bed laundry must also be supplied yourself unless you make special prior arrangements with the Hausmeister (for an extra fee). We thoroughly enjoyed our stay and would definitely return! Sehr schön und ansprechend ausgestattete Wohnung. Werden wir bestimmt wieder einmal buchen. Eine schön eingerichtete Wohnung mit sehr großem Balkon. Stani der Hausmeister ist ein netter und hilfsbereiter Mann, der auch kurzfristig vor Ort ist, wenn man ihn braucht. Der Vermieter selbst, auch wenn wir nur telefonischen Kontakt hatten, sehr zuvorkommend! Wir kommen definitiv wieder. Wir haben uns in der Wohnung sehr wohl gefühlt. Es ist alles da, was eine Familie braucht. Besonders der Wohn- und Essbereich ist gemütlich eingerichtet. Der Hausmeister ist sehr freundlich und engagiert. Besonders schön und empfehlenswert ist auch die Region Maria Alm - Hochkönig. Ein Urlaub an den wir uns gerne erinnern! Bei Buchungen unter 30 Tage bis Anreise ist der Mietpreis zu 100% sofort fällig. Stornobedingungen des Vermieters: bis 14 Tage vor Reiseantritt 50% Erstattung, bis 30 Tage vor Reiseantritt 100% Erstattung.